The first person to PM me will be the winner. It could be you,don't be afraid,give it a go,it is good fun. As there have been no replies to Ivan's challenge I have decided that it is time to call a halt and thank all of you for taking part. I started the challenge with one of my turnings so I asked Ivan to send his piece on to me. 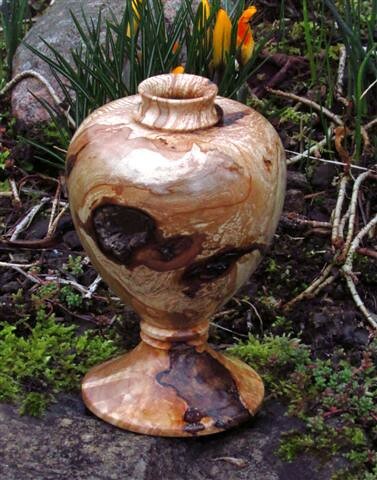 Lucky me, A beautiful little hollow vase made from spalted beech, 5" tall and what a splendid piece of wood ,gorgeous grain structure and a superb finish . Very well done Ivan and I am so very pleased with it. One to treasure.Many thanks. That is a spectacular piece Ivan. Well done. If it looks right it usually is. Pass the Parcel is Back for those in New Zealand & Australia. after a recent visit by John Hodgson to NZ he has sent me the parcel to see if there is an interest in the south as it didn't work for us before with time limits and postage. I have added this post to the original so you can see how it worked and the type of the challenge. Those that are interested it would be good to know ( just post I'm in or yes ) to give an idea I would suggest instead of it going back an forward across the Tasman sea we do some first ones here then Australia but it will be up to the those willing to take up the challenge to decide , Owing to the postal service being slow and distance we make the time limit 4weeks but nothing to stop it being reposted sooner . If you have friends that do not visit the forum on a regular basis let them know. I will post the first Password on the 3rd of May at about 8pm NZ time the first to pm me after that with the password and willing to take up the challenge will be sent the parcel with a turning. The one I received from John is the same as the one sent to Neil in the first post good luck we will see how it goes. Thanks for the support Neil I have also received a vase the same as yours. It came to a end..... Sure it will be good fun for those who take part. Ok so the pass the parcel only received only 1 reply in the south from Chris Smith in Perth Australia so we have decided we will exchange turnings ( have sent mine ) and I have returned the parcel to John Hodgson in Scotland along with a turning . Hi all its a shame the turners down here didnt get behind this though Im not sure how many ozzies and kiwis are actually on this forum ? any way thems the breaks I suppose ,Ian has graceously sent me one of his pens and I will do the same ,Im popping out today to get some pen kits so Ian will get one of those sent asap ,you know we all have some nice pieces of work hanging around the house that we could do a swap as we,ve done before and found that we ended up with a nice piece of someone elses work thus starting a woodturning collection of you own ,I have woodturning from all over the place and Im proud of them give it some thought guys .Ian thanks for trying mate and also john theres a lot of missing out getting done hey! Chris I know there are members from both country's on here but it seems as with a lot that join they make one request for information or none then never log in again sad really but that's the way things are. there are 2 in todays birthday list . Pass the parcel has been completed in the south with a pen swap between Chris Smith and myself today I received 2 beautiful pens from Chris made from some nice Aussie wood.